pot pan is my favorite thai restaurant in all of chicago. i was introduced to pot pan a few years ago by my boss (hi, erin!) ... see, we love pot pan ... & we have ordered it for lunch many, many times. the sad news is that pot pan does not deliver to my house in lakeview. tears. but that's ok. because i finally made the trip over to wicker park (on n. milwaukee avenue to be exact, next to antique taco) & dined in the actual pot pan restaurant! 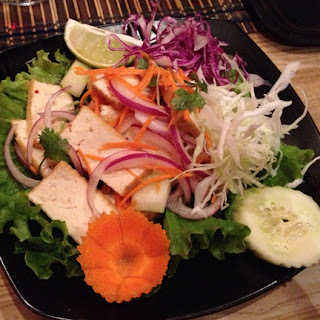 steamed tossed with onion, cucumber, carrot, tomato, cilantro & lime juice, served on top of a romaine lettuce leaf. tofu + lime is one of my favorite combos. the tofu at pot pan is top notch, so this salad was basically light, yummy perfection. 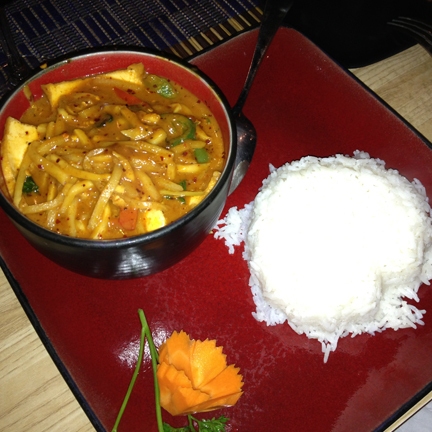 tofu in coconut milk, bamboo shoots, bell peppers, hot peppers & basil leaves. my favorite favorite favorite red curry. honestly, the best in chicago that i've had. (opart thai house is a close second.) super spicy, but also perfectly sweet. besides having amazing food, the real reason i love pot pan so much is that they are very accommodating to vegetarian & vegan needs. sooo many places won't make their red curry without fish sauce, but they will at pot pan. and they have lots of other dishes that can also be prepared vegan. so that makes them automatic winners. check them out! ¡ la chi city vegan : back to españa !